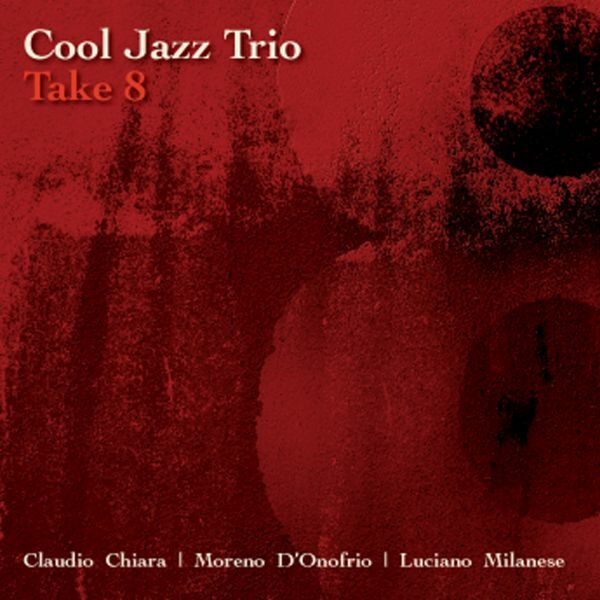 ‘ TAKE 8 ‘ COOL JAZZ TRIO A band named after one the most important and fertile period of jazz, with an appropriate repertorie, marks a specific aesthetic direction. It means above all belief, since the beginning, in a world maybe forgotten but rich in truth and beauty, emotions and poetry. “Cool” here means intimate, fresh and colloquial, rather than an aseptic recall to typical atmospheres such as Lennie Tristano’s o Gil Evan’s and Miles Davis’ ones. Unfortunately, these are qualities musicians shows less and less, not only in Italy. Well, these three musicians gcing each other their han turn all this features into their own artistic belief all along. certainly not for revival cultural acquiescence but to obey to an intrinsic philosophy, an urgency which can be expressed just this way. MORENO D’ONOFRIO is a Guitar Player who disdains effects and bad effects, he wanted to regain one of the most limpid and pure timbre possible, he plays with a refined technical skill and a clear-headed conversational attitude, a deep honesty of purpose. He found his original voice, in a few words, although inspirer exist, starting from a leader such as Jim Hall to an excellent but also unknown Ed Bickert, mooving towards many directions through six strings history well known by Moreno. Starting from these assumptions his natural propensity for duo or trio arises, they are situations where you’re never able to cheat. CLAUDIO CHIARA stroke everybody deeply some years ago, when he worked hard for a Charlie Parker tribute which forced him to an extraordinary challenge. Now it sounds like his saxophone has gained personality and presence, although starting from Bird’s lesson, obviously, but also Phil Woods’, Bud Shank’s, Hal McKusik’s ones and, why not, some teachings by tenor players like Zoot Sims or our unforgettable Gianni Basso. We’re meeting a great story-teller, who plans his chorus in realation with a far-sighted way of thinking, capable to catch attention since the first notes. Last but not least LUCIANO MILANESE one of the most important bass player of the Italian jazz history, a byword for swing, toughness and good taste; he’s been also a leading character in many records and musical featurings. CD’s tracklist is beautiful and level related to sound take remarkably accurate and faithful, playing instrumental acoustic dimension up in the right way. It’s very important to underline how this eight standards were very appreciated also by singers, who often performed extraordinary cover of these songs: Frank Sinatra, Shirley Horn, Johnny Hartman, Helen Merrill, Sarah Vaughan, Ella Fitzgerald, June Christy, Mark Murphy just to quote some of them. What means that? Simply great soloists always pay attention to lyrics when they perform a song, a necessary starting point in order to understand the essence of the composition and to develop their interventions the best they can. Here the trio complies with this method perfectly. In this way were born small “musical” jewels where everyone will be able to find something close to his or her own sensitivity, you’ll be spoilt for choice, with the great duo on “Beautiful Love” or with the elegant and discreet “You’d be so Nice” until aching ballads such as “For Heaven’s Sake” and above all “Here’s That Rainy Day”, one of the most fascinating tunes ever written. One Advice: do not listen at this CD while you’re driving or as a background music, treat yourself to fourty relaxing minutes, insert your CD in a good hi-fi system and sit on the sofà, without thinking anything. Time will fly and you’ll see things around you with different eyes.